Despite having moved to Seattle 29 years ago, I still have moments when I feel like a stranger in a strange land. One such moment occurred this afternoon. We drove down to University Place, a suburb of Tacoma some 40 miles from here, where our friends Fred and Jeni live, so we could join them and their family for a barbecue. Their house is on a main street in a residential area that lies just past a commercial district. As we passed through the commercial strip, I noticed one of the store signs in a mini-mall to our left: Soggy Doggy. What a soggy doggy store does is a matter to which I gave no attention. I was too focused on the apparent rhyme, and on how out of place it made me feel. My vowels have shifted a bit over the years, but not to the point where ‘soggy’ and ‘doggy’ come even close to rhyming. Indeed, my pronunciation of ‘dog’ is the primary evidence for Gail of the continued existence of my New York accent, and I’m fairly confident that no store in New York would name itself “Soggy Doggy.” For a moment this afternoon, I just wanted to go back to the land where people talk normally. This issue is not new territory for Ron’s View. Two Septembers ago, in one of my very first posts, I wrote about the apparent rhyme of ‘chocolate’ and ‘mockolate’, concluding that “maybe some day I will be able to see the rhyme immediately. And maybe some day, when [Gail] suggests that I take a walk, I won’t take a wok out of the cabinet.” I don’t think that day is going to come. What is Soggy Doggy? From their webiste, I’ve learned that it’s self-service doggy wash with doggy boutique, doggy bakery, and washmatic hydromassage. “The Washmatic is the easiest way to get your pet clean. 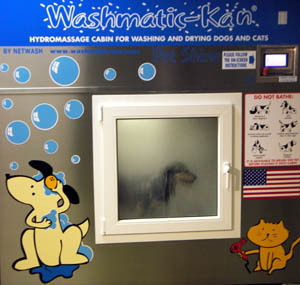 In only 5-6 minutes The Washmatic can wash and rinse your dog or cat and give it a soft and shiny coat. After the final rinse is completed you may either remove your pet and be on your way or allow The Washmatic 25 minutes to gently and easily dry your pet.” I can’t imagine Emma going for that. Would any cat?